Well there is no doubt about it; the cold has hit us, so what better way to warm up than from the inside out. Chili is a great way of doing it, but until we learn how to use it, it can be a midfield. So today I'm going to tell you how to use it and how to prep it. Yep the burn of chili is one of the lessons I learnt the hard way, by itching my eyes with my unwashed hands, and making inedible food. First the health benefits. Here at MC&L we want to bring you great tasting food but equally we want to tell you why we recommend these foods, so you can be informed about what’s going into your body and eat your way to a happier healthier life, to go with that new body Jo is helping us all to make. There are loads of benefits of eating chilli and if I was to go into them all, I’d be here for a week so I’m going to concentrate on the three that interested me the most; lowering blood sugar, curbing your appetite and burning fat. Yep gang you heard, it has been scientifically proven that eating chilli burns fat. So how does it do these things? It’s because it contains a chemical called capsaicin and it’s this which gives chilli and spices like paprika and cayenne their heat. Capsaicin stimulates a natural process which means some of the food we eat is turned immediately to heat, that’s why we get physically warm/hot eating something spicy. That means that our bodies are burning up the calories automatically as opposed to storing them. To further encourage you to start including chilli The British Journey of Nutrition has said that that their studies show that when we eat chilli spiked food, we feel less hungry and eat significantly less at the next meal. BONUS! But before you go ye-ha eating it, I’ll share one more bit of info which I learnt from the TV programme The Food Hospital and that is just like your body gets used to the same type of exercises so it gets used to the effects food have on it. So if you eat a lot of spicy food and have a hot curry and your friend doesn’t have chilli and eats the same curry, the fat burning benefits will be greater in your friend than you. They’re still there though, so get eating it! So enough of the chat let’s get chopping. 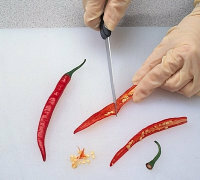 In professional kitchens they more than often than not wear rubber gloves, because chilli irritates the skin, burns and stings – remember the eyes Ouch! I know I won’t be the only one to have done that. So I guess to don your gloves would be the first thing to do. I don’t always wear gloves as a home cook but I always wash my hands and use a nail brush after I’ve hand chopped it. As with all produce wash it first and pat dry. Cut chilli in half lengthways. Scrape out the stem, seeds and veins with the edge of your knife. If you want strips of chilli then cut them again in half then you have 4 same sized strips nice for crossing on top of a Thai curry or something similar. Now the heat is in the seeds so if you want a hot dish then just add more, I’d recommend about ¼ teaspoon per portion. What if you use too much chilli? Natural yoghurt cools it down, so you can pop that into curries, chillis etc. Avocado also provides a nice creamy cooling. With the nights getting colder and darker, I hope today has make you want a bit of spice in your life. Until Friday, stay clean & lean guys!